Give the agent a starting credit for sliding scale and cap plans. 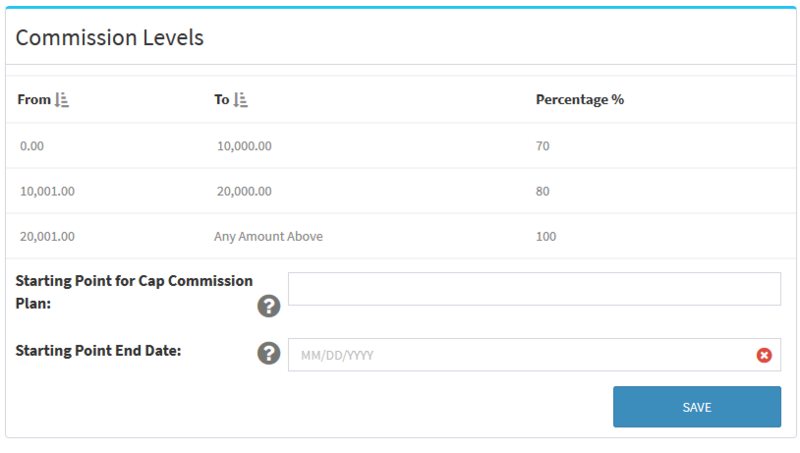 If a new agents needs to have a credit on their commission plan from past transactions they did outside of BrokerSumo, you can enter a starting value in their profile and that starting point value will be used when calculating where they are in their sliding scale or cap commission plan. Go to agents> click on the agents name and then on Commission Plan & Fees tab. You can enter the starting point for the commission plan and the starting point end date. The starting point field is a dollar amount. For example you have a new agent that has started and they have a $15,000 cap and they have already paid in $5,000. When entering your levels in the commission plan you would enter $5,000 as the starting point. The end date, is when we should stop applying that value to the agents plan we use until the end date passes. So the end date should be the day before they rollover and start the plan fresh.